SEGUIN — One local artist is helping grandparents across the globe celebrate the birth of their new granddaughter. A birth is certainly something to be celebrated, and Ben Griepink and Trietsje Bangma of Belgium are doing it in style with the help of Seguin sculptor Marika Bordes. Bordes said it all started with a visit in September. “Ben and Trientsje came in September to visit a friend, and stopped by the gallery,” Bordes said. “They really liked the work and asked me if I would make them a sculpture to commemorate the birth of their first grandchild. I submitted them two drawings, and they chose this one called Plenitude. After deciding on a design, Marika began the long process of carving the wood. She started with the stump of a mesquite tree, she said. Over the course of six weeks, Bordes carved away at the wood, and sent weekly e-mails to the couple to show them the progress. Finally, Plenitude came into shape. The work is a sculpture of a child in a mother’s lap, hugging her with outreached arms. The sculpture rests on a piece of metal work shaped like a crescent moon. The sculpture was sent to Europe on Dec. 17. Bordes said she hoped to get it to the happy new grandparents by Christmas. What began as a piece of what most people consider firewood, became a family’s expression of joy for the gift of a new life, Bordes said. 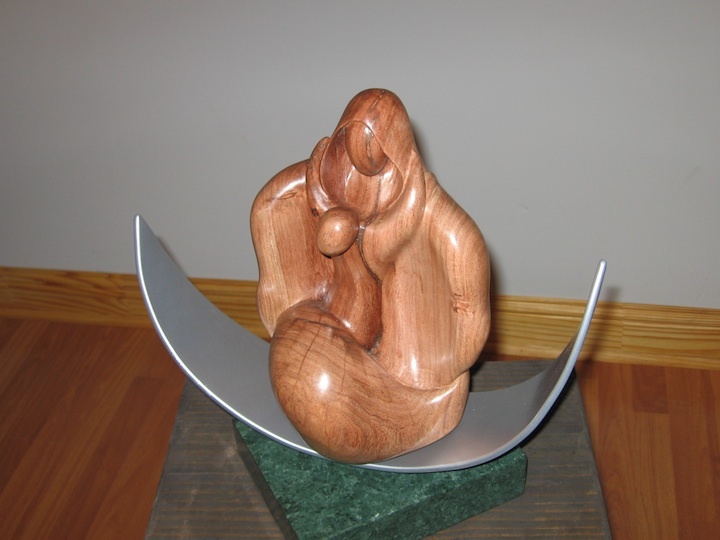 Bordes work has celebrated new births before, such as the sculpture called Maternitree, which is in the new maternity ward at the Guadalupe Regional Medical Center. This entry was posted in Commission. Bookmark the permalink.